Tangerine trees provide sweet, slightly floral citrus fruit. A type of mandarin orange, tangerines feature loose skin that bubbles around the fruit instead of clinging tightly to it. 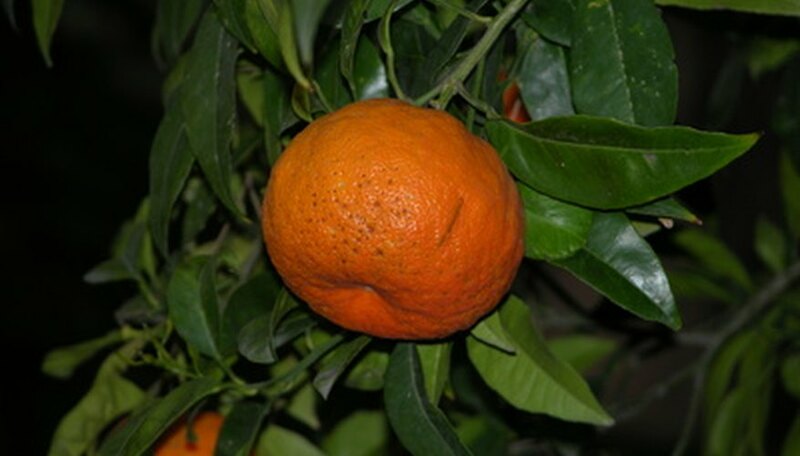 Gardeners in temperate locations can plant tangerine trees in the ground, while those in colder zones can try to grow tangerines in containers. Plant a tangerine tree in the early spring, preferably on an overcast day so the sun does not stress the transplanted tree, and choose container-grown tangerine saplings for planting. Select a location that offers your tangerine tree room to mature, protection from wind and full sun. The tree won't bear fruit if not planted in full sun. Dig a hole for your tangerine tree that's twice as large as the plant's root ball. Remove sticks, rocks and weeds from the hole. Pull your container tangerine tree free from its container by tugging the trunk. Crush the root ball between your hands to break it apart. Unwind tangled roots. Wash off the tree trunk and roots with water from a hose. According to Texas A & M, container citrus trees are usually planted in a soilless medium. If you don't wash off this medium, young trees can have trouble adapting to the soil and will fail to thrive. Washing the roots allows them to take root in the soil immediately. Place the tangerine tree in the prepared hole and check to make sure it's planted at the same level as it was in the container and standing vertically straight. Fill in the hole with soil, packing the soil lightly around the roots and trunk. Water the newly planted tree until the soil grows saturated with water and compacts around the base of the tree. Drive two wooden stakes into the ground (by at least 6 inches) on either side of the tree, locating them 12 inches away from the tree trunk. Then tether the trees to the stakes with rope, tying the rope loosely to the tree. If the rope is too tight, it will cut into the bark as the tree grows.